Mike Rabon had been playing guitar since the age of eight. He was in an Oklahoma band called the Rhythm Rebels in the late 50’s. The Mutineers formed in 1962 on the Southeastern Oklahoma State University campus. They played a lot of gigs at colleges. 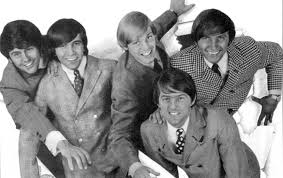 In 1964 the founder of Abnak Records, insurance sales man John Abdnor, got the band to sign a record contract. He also gave them the name, The Five Americans, so they would be clearly identified as a home grown band and not part of the British Invasion. 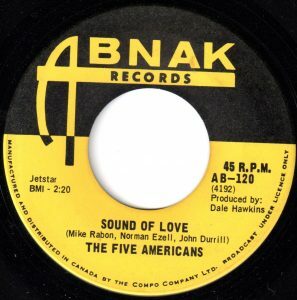 The first singles The Five Americans released were in the winter of 1964-65. “Say That You Love Me,” I’m Gonna Leave Ya”, “Show Me” and “I’m Feeling Okay” all got airplay. These singles introduced the band to radio listeners in Dallas, Fort Worth and Wichta Falls, Austin and Waco, Texas, and Oklahoma City (OK). But it was “I See The Light” that got the band to the #2 spot in Austin (TX) and #4 in Sacramento (CA) in December 1965. A reissue of the song on HBR records took the tune to #1 in San Jose and Columbus (OH), #3 in Tampa (FL) and Syracuse (NY), #4 in Lexington (KY), #5 in San Diego and Dallas, #6 in fort Worth, #7 in Los Angeles, #8 in San Bernardino, and #9 in Vancouver (BC). However, their follow up garage band genre tunes, “Evol Not Love” and “Good Times” failed to garner much interest. In the 1950’s rockabilly singer Dale Hawkins had a hit in 1957 titled “Susie Q.” It was the same Dale Hawkins who was working for Abnak Records as an A&R man. Hawkins ended up producing “I See The Light” and other hit singles by the Five Americans. With their garage band follow up single releases failing to expand their sales and fan base, The Five Americans softened their garage band sound and adopted a sunshine pop sound. Songs like “Western Union”, their biggest hit reaching #5 in the USA, were a prototype of what would become a basis for Bubblegum Pop in 1968. “Sound of Love”, their third Top 30 hit, was another example of Sunshine Pop in late spring of 1967. “Sound Of Love” was a photo-bubblegum hit. The actual sound of love in the song is the sound of the singers’ heart going “Oom-pah, oom-pah, oom-pah, oom-pah.” This his a reaction to being held, squeezed, teased and pleased. This is what the guy in the song gets to experience first thing in the morning and the last thing at night. He is astonished at his hearts’ beating reaction to all this physical attention, including hearing his sweetheart whisper in his ear. Oom-pah, oom-pah is the rhythmical sound often associated with the tuba. The oom-pah sound is usually made by the tuba alternating between the root (tonic) of the chord and the 5th (dominant) — this sound is said to be the oom. The pah is played on the off-beats by higher-pitched instruments such as the clarinet, accordion or trombone. In 1960, the West End musical, Oliver Twist!, opened in London, England. A Broadway production opened in 1963 and ran for 774 performances. One of the songs in the musical was “Oom-Pah-Pah”. “Sound Of Love” had its best chart runs in Wichita, Kansas, and Fort Smith, Arkansas (#1), Tyler, Texas, and Vancouver, Washington (#2), Akron, Ohio, Louisville, Kentucky, and Augusta, Georgia (#3), Grande Prairie, Alberta (#4), Springfield, Massachusetts, and Grand Rapids, Michigan (#5), Pensacola, Florida, and Quincy, Illinois (#6), Vancouver, British Columbia (#7), Corpus Christi and Dallas, Texas, Billings, Montana, and Erie, Pennsylvania (#8). After “Sound Of Love,” the Five Americans next single was “Zip Code”. It was coincidentally on the pop charts with two number one hits, “The Letter” by The Box Tops letter themed hit by Lulu, “To Sir With Love”. All three songs were in the Top Ten in Vancouver in early September 1967. (As the Vancouver radio market was often a test market for European songs, “To Sir With Love” didn’t reach it’s peak on the Billboard Hot 100 until late November 1967). After “Zip Code” the band failed to repeat their earlier Top 40 success. They tried to build on their communication theme started with “Western Union” and continued with “Zip Code”, by releasing “No Communication”. But the song was considered too gimmicky and was a commercial failure. In 1969 they disbanded. Rabon went on to tour as a solo artist and subsequently joined Gladstone, a pop group from Tyler, Texas. Gladstone had a minor hit in 1972 about a marriage license called “A Piece of Paper”. John Durrill wrote a song called “Dark Lady” that became a #1 hit for Cher in March 1974. In 1969, Durrill became a member of the instrumental band, The Ventures. He had written hundreds of songs and artists like Frank Sinatra, Nancy Sinatra and Brenda Lee have recorded his tunes. Durrill continues to write, including projects in film. Norman Ezell became a teacher and Christian minister in California. Jim Grant, who designed The Five Americans albums, went on to be the head of a graphic design company in Dallas. On March 15, 2003, The Five Americans returned to Southeastern Oklahoma State University, in Durant, OK, to perform in concert. Jim Grant died in Dallas in 2004. Norma Ezell died in 2010. And Jimmy Wright died in Denison, Texas, in 2012. Mike Rabon went on to become a school teacher, building on his degree in Speech Education. In 2011 Rabon authored a book about The Five Americans called High Strung. In his autobiography, he detailed that by 1976 he’d become a “full-blown addict” to drugs, sniffing bags of white powder. Rabon found it ironic that he ended up in that state, given he was the one who laid down the no drug policy for The Five Americans. He also describes himself as clinically depressed and hooked on Vallium. Several Five Americans bandmates had become alcoholics. Rabon reflected, in High Strung, that perhaps he should have established a policy about alcohol consumption as well. It seems even a garage rock band become sunshine pop/bubblegum group like The Five Americans fit the stereotype of rock musicians living to excess.